The rise of ecommerce is pushing brands to outdo each other in providing the best digital customer experience, but has this rapid evolution created a mismatch between customers' expectations for their online experience and what they receive in the real world? This growing divide has prompted many retailers to re-examine their in-store environments, and create retail concepts that are far removed from traditional display cases and counters. 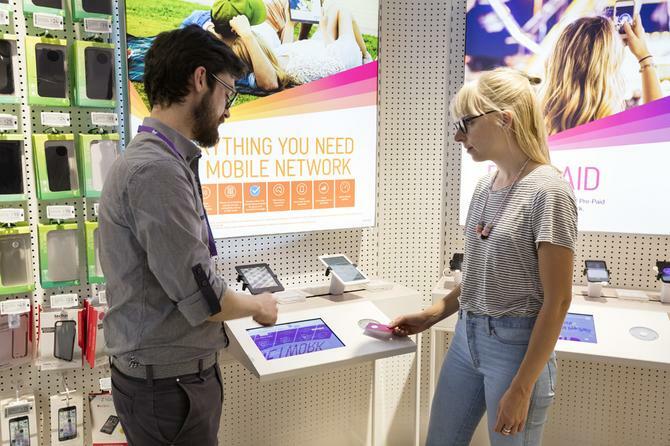 One of the latest companies to revamp its physical experience is Telstra, which in October 2014 opened its first Discovery store at the corner of Sydney’s George and King Streets. A second store opened on Melbourne’s Bourke and Swanston Streets a year later. Boasting an open plan layout dominated by a multi-screen video art installation, and bereft of the usual counters and desks, the stores have delivered on expectations of delivering a more engaging experience for customers, and better sales performance for Telstra. Masterminding the development and delivery of the Discovery stores was Telstra’s general manager of innovation and technology Joy Marrocco. Speaking ahead of her appearance at the annual CustomerTECH X conference in Melbourne, Marrocco describes her brief as to ‘reimagine a Telstra store and what it does, and to create a connection between people and technology in the store’. “We wanted to build an environment that really changed the way people think and feel and talk about Telstra, rather than having them just bursting through the door with a problem to solve,” Marrocco said. “We needed to give them something more, because customers expect more from us. While time was spent mapping the various ‘journeys’ that led customers into stores, Marrocco says this work was eventually scrapped in favour of creating four broad mindsets - locator, explorer, dreamer, and resolution seeker. Interaction scenarios were then designed to cater to these, supported by technology. Throughout this process Marrocco says her team was guided by the desire to bring together the online and offline experience of Telstra customers, with license to create new technologies to enable this. One example is an innovation that Telstra has dubbed ‘tap and take’. Store visitors are given a chip card they can tap against beacons to gather information about specific products and services. When the leave the store they can then access an online portal which will bring up information about those products and services. Another innovation has been in staff training, with the elimination of product specialists who inhabit specific areas of the store environment in favour of all staff being trained across the entire Telstra product suite and use of technology within the store. “We call the central part of the stores the ‘dancefloor’,” Marrocco explained. “You get a ‘partner’, and your partner stays with you for the entire experience of your instore experience. All the staff have laptops or tablets, and they can sit with you anywhere in the stores and have a conversation with you. “As a result, we are finding that customers are much more relaxed. They are opening up more, and we are having great conversations with them. Our consultants are trained to pick up on triggers from those conversations about the customers’ needs, further than what they are asking for during that visit. Because we know more about them, therefore we are able to tailor really personal solutions to them about the way they like to connect with their friends and family. The stores have also become a showcase for Telstra’s enterprise sales teams, which has been leading corporate tours on a near-daily basis, while the Discovery concept has become the new template for refurbishments of smaller stores. Marrocco has since moved on to a new role as general manager of IT transformation, with responsibility for evolving Telstra’s contact centres. She says she will be taking many of the lessons learned through creating the Discovery stores with her.